Pain. It’s a daily companion. It is far easier to count the days when I don’t feel pain than when I do and when that happens, I am acutely aware of it. It happens when I walk which pisses me off. I used to have a very infantry mindset of if the destination is less than two miles, it is walking distance. So not too long ago, I walked everywhere hard and fast. Most of the time it is a very low level pain; Not enough to debilitate me, but just enough to let me know that it is there. The more active I am, the more intrusive the pain becomes… It is as simple as that. I try not to let it dictate my life, but it lets me know my limits. Last August I climbed Mt. Oyama and pushed the pain to the limits. While writing this I first was using flowery language like conquering or defeating the mountain and/ or pain. Pain is never defeated though, it is endured. So a better way to describe such a sojourn is that I endured it. So for a more accurate description of travel, it is something I endure. Pleasure from travel is usually bleached so that all that is left is to endure. So, continuing from yesterday’s post of Shinjuku. I actually had a good time, and I concede that a lot of my dislike of Shinjuku has to do with my ignorance of it. This time I had a knowledgeable guide (who is probably reading this blog too) and some good friends. We started off our little tour with a little gem of place called Omoide yoko cho. It was an alleyway filled with micro bars and eateries that is directly next to Shinjuku station. I must admit it was quite interesting and much more atmospheric and real compared to my image of Shinjuku. My friend who was visiting from the US is a collector and connoisseur of fine whiskies so we went to a couple of Jazz bars and whiskey bars. The largest of these was a bar called Zoetrope. I loved the atmosphere in there although I am somewhat of a philistine when it comes to alcohol. My friends took great pleasure in sniffing and sipping of these alcohols. I don’t see the draw in it, and didn’t get a fraction of the enjoyment they got out of it but to each their own. I am not foolish enough to claim dominion of all the pleasures of the world. They looked like kids in a candy store though, and that was all the enjoyment I needed in that. Zoetrope had a wonderful atmosphere though and they showed old silent films and an extensive collection of whiskies. One of my friends, through a very able translator, grilled the owner/barkeep of the Zoetrope on how and where to buy whiskies to the deepest extent of his knowledge. From there we did a little shopping and went to the terrace of a larger department store to get a free view of Shinjuku. After that, we walked through Golden gai, Okubo and Kabuki-Cho. By the middle of the evening the pain was reaching a crescendo and threatening to debilitate me. While we were walking through Okubo I was concentrating more on staying upright than looking at the sights. My good friends say they had enough for the night and were suffering from jetlag, but I get the feeling they just wanted to give me a break. We were guided to an entrance to Marunouchi subway line and a clear line of sight to Shinjuku station proper and it is there were we separated and I hopped on Odakyu line. Odakyu Shinjuku station recently implemented having 3 lines per train door instead of 2 which has caused a massive problem. You see the person on the right or left wait for the doors to completely open and then enter while the middle line draws a more aggressive crowd who wait for the door just to crack and blitz in, shoving past the right and left. For those who have never ridden a rush hour train in Japan, a seat is like gold, and a corner seat is worth your weight in gold. Getting a seat on a train trumps all forms of social manner or courtesy and especially during rush hour, overrules any form of concept of social more. Shinjuku is the originating station of the line, so there is a black Friday rush to the seats. I of course got a seat, and it was fortunate that I did with the pain being as intense as it was. By the time I got to my station, the last bus had long since rolled out and I had to take a taxi home… I then took a long, hot shower and bath that helped a lot before hitting the futon. 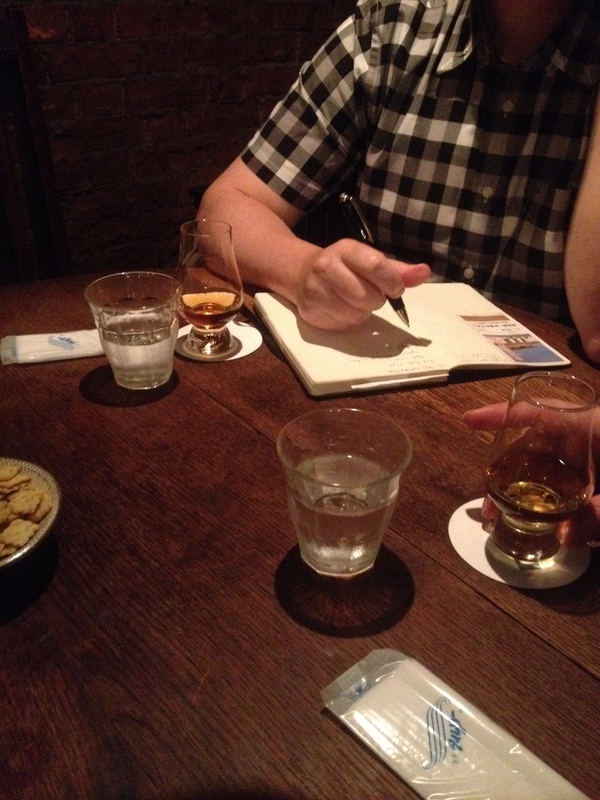 Posted in This American Life: JapanTagged Odakyu, shinjuku, Whiskey bar, ZoetropeBookmark the permalink. A nice essay on Shinjuku’s charms and not so charming things.